This is no ordinary Porsche Boxster. Attributes typically associated with a supercar include expensive price tag, (preferably) mid-engined, fast, driver-focused, impractical, and great looking. If we eliminate that expensive part, as we do with all of our $50,000 supercars, the Porsche Boxster Spyder seems to check all of the other supercar boxes. The Porsche Boxster has always been thought of as an entry level exotic, but the Spyder model takes the basic Boxster formula to the next level. Amazingly the first generation Boxster Spyder is now pretty affordable. 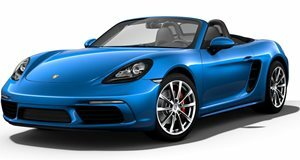 At the 2009 LA Auto Show, Porsche revealed its fastest Boxster model to slot above the S. The Boxster Spyder was released in 2010 as a 2011 model with a base price of $61,200. It's clear that times have changed since 2010 because a new Boxster Spyder now starts off at $82,100. The 2016 model is very similar to its coupe brother, the Cayman GT4, but the original Boxster Spyder shared a lot in common with the GT4's predecessor, the Cayman R. The 2016 Boxster Spyder is greatly improved over the 2011 model, but we struggled to find one for less than $100,000. That makes the original Spyder an extremely good value proposition on the used market. At the time, the Spyder was the lightest version of the Boxster, weighing in at 2,811 pounds, a full 176 pounds lighter than the Boxster S. Porsche made the Spyder lighter by replacing the power-retractible roof with a manual roof, and eliminating the radio, door handles, air conditioning, storage compartments, cupholders and LED light modules on the front fascia. Some of these options, like the air conditioning, could be re-added for an extra fee, although true track enthusiasts would probably leave them off. Powering the Boxster Spyder was a 3.4-liter flat-six engine with 320 hp and 273 lb-ft of torque. This was 10 hp more than the Boxster S, and is basically the same engine as the Cayman S.
Unlike the 2016 Boxster Spyder and Cayman GT4, the 2011 Spyder was available with either a six-speed manual or seven-speed PDK dual-clutch. Even a Boxster S owner like the Grand Tour's James May, loved the Boxster Spyder when he drove it on Top Gear. The only issue that May seemed to have about the car was that the roof was a bit ridiculous in the real world. Having a power-retractible top is extremely easy, but the Boxster Spyder's "Sun Shade" roof basically has to be built, which is not exactly speedy. Complicated roof aside, the Boxster Spyder is a wonderful car. Think of it as more of a collectible toy, rather than a practical weekend cruiser, and suddenly the roof doesn't seem so bad. This car is clearly more unique than a standard Boxster or Cayman, and would provide instant popularity at a local Porsche meet, without having to spend huge money on a special edition 911. Most Boxster Spyders are over $50,000, but we managed to find a manual example, and a PDK-equipped model for less than $50,000. These cars have held their value fairly well, and could be worth more as the years go on and cars like this cease to exist.